If you use a Bakfiets virtually every day eventually you are going to have to deal with inclemency. This year we have been dealing with inclemency since the summer began but now that the winter is here with a vengeance biting winds have been added to the rain. What is the purveyor of a precious cargo to do? 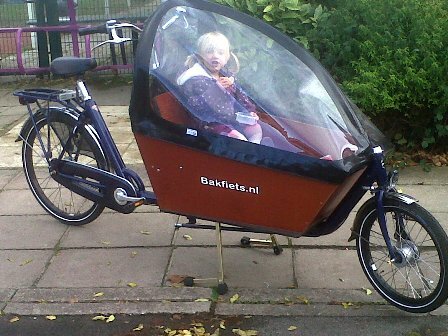 With a really big bike as your chosen mode of transport you have a choice of two options and, given that the Dutch have very similar, if windier, weather to that of the UK, both options have been catered for by the Bakfiets design team. The first option is the hardy approach. If you are an adherent to the old adage that there is no such thing as bad weather, only inappropriate clothing, this one is for you. The hardy approach involves kitting out your cargo in their best wet-weather gear, jamming the hats firmly on the head of cargo and captain alike, and heading off into the squall. The Bakfiets design feature included as standard that will meet your needs in this instance are the four holes in the floor of the box, one in each corner. No matter how hard it rains, you can be confident that you won’t be pedalling with water in the bilge. How much weight is taken on board by the absorbency of the cargo is down to the appropriateness of the chosen clothing. The second option may be termed the deluxe approach. This approach involves using a Bakfiets rain hood, an elegantly designed and sturdily constructed cover that fits simply and quickly to the Bakfiets box, ensuring that the cargo is warm and dry at all times. Freed from the worry of a dampening and increasingly disgruntled bikemate, the captain is left in peace to cope with the effects of side winds on a tall structure and marvel at the improvements to the drag coefficient that the rain hood appears to bring. There is also an added benefit in that the rain hood offers some protection for the pedaller’s legs, particularly if you are able to maintain a reasonable pace. This second (deluxe) option does mean additional expense – some £160 – but this, having braved the first option during a very wet August, was our preferred option. Although the hardy option has much to recommend it and is still employed on those ‘will it, won’t it’ days for short trips, the rain hood has already seen plenty of use and has proved invaluable. No matter how bad the weather, you can be confident that your cargo will arrive at her destination warm and dry, although the warm, dry conditions do tend to create a very snoozy environment, which may or may not be a cause for concern depending upon your planned bedtimes. Putting the expense to one side, the drawbacks of the rain hood might be said to include storage – away from the bike the hood comprises a large triangle of heavy-duty plastic that really needs to be hung somewhere that is both out of the way and accessible (a garage in our case) – and that fact that it does not stow – once it is attached to the bike it won’t fold down during the journey. However, the positives are plentiful and persuasive. It is very simple to install upon delivery, requiring only a few screws to fit the four clips and anchors. it is quick and easy to put on the bike on a day-to-day basis, which means you will actually decide to use it rather than thinking, “I don’t have time to fiddle about with that now.” Most attractive of all, it works. The cargo is warm. The cargo is dry. The cargo is happy. And so am I. Excellent value at almost any cost. 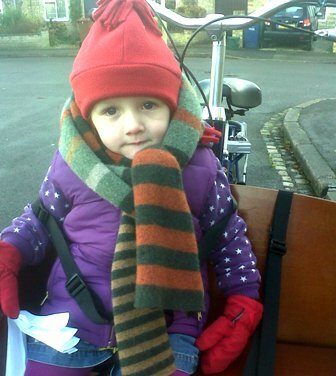 This entry was posted in Uncategorized and tagged Bakfiets, bikes, cycling, transport, transportation by jonnyives. Bookmark the permalink.